This weekend sees the biggest festival celebrating Maori culture in New Zealand – the kapa haka championships, known as Te Matatini, take place in the town of Tauranga on the North Island in the Bay of Plenty. New Zealand was originally known to the Maori as Aotearoa, or the Land of the Long White Cloud, and whereas in days of old Maori tribes fought for real, they now compete against each other in terms of dance and song before crowds of thousands. 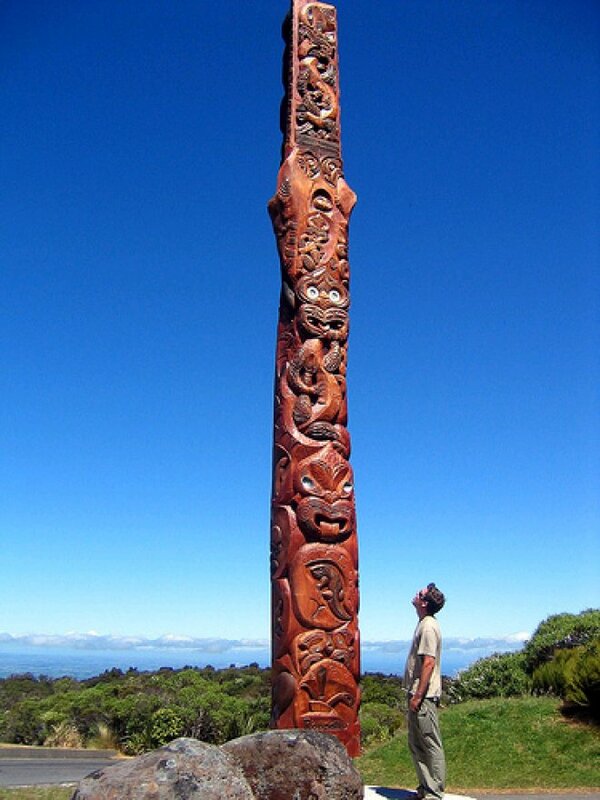 Alongside the dancing are traditional songs, choral events, and exhibitions of skills in making Maori art and clothing. The Guardian have a photo gallery of the event here. (Click on each picture to open the next one). Not many people have seen a haka up close so it is easy to see why it is a popular and educational day out. Anyone who has watched rugby union will know the New Zealand rugby team always perform the haka to intimidate their opponents before kick off, but this form of aggressive dance is only one of many. Some dances tell of stories and legends while others are done as a form of welcome. Ten years ago in Rotorua on the North Island I joined a tour to visit an old style Maori village and to have a dinner cooked in a traditional underground oven (or hangi) over hot rocks. It was a popular tour with coach parties, and our guide explained that each bus was considered a ‘tribe’ and he needed a volunteer to be the ‘tourist chief’. The Brits shrank into their seats while the North American contingent in our group clamoured for attention. Once appointed, each new chief, (one from each bus), had to lay down a leafy branch at the village gate as a demonstration of friendship. As we all looked on, he or she than had to stand still as a club weilding Maori village chief performed a threatening haka, before the ‘branch of friendship’ was picked up, which signalled the all clear to walk through the village to dinner where dances and songs were performed by the ‘villagers’. We were then encouraged to have a singalong on the coach on the way back to the hotel. That was a memorable evening out – book it if you dare. You can watch the All Blacks performing the Haka and there is more information on the dance here. If you are interested in the All Blacks, there is not much you can’t find out about them on their on-line history, and you can find a wealth of information on the history of the Maori people, the stories behind their dances as well as history of New Zealand on this New Zealand history site. If you are contemplating a trip, the New Zealand Tourist Board website is a great place to start. The word tattoo comes from the Tahitian word tatau. Captain James Cook used the word tattow when he witnessed tattooing for the first time in Tahiti, in 1769. “Nobody cares of you can’t dance well. Just get up and dance. Great dancers are not great because of their technique, they are great because of their passion”.